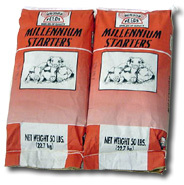 A complete grain ration used for developing gilts or growing pigs. A supplement to be mixed and fed to pigs from 30 to 50 lbs. Mixing Directions: ON REVERSE SIDE.